7 brushes. Claudine Hellmuth Studio Artist Brushes are a collection of 7 artist quality brushes with synthetic bristles that have a luxurious feel and excellent resiliency. 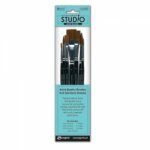 With 4 round and 3 flat brushes in the set, they’re great for painting and applying Claudine’sPaints, Multi-Mediums and Gesso. Gift Bag Punch Board - We R Memory Keepers .